Platelet inhibition remains the core pharmacotherapy component in patients undergoing emergency or primary percutaneous coronary interventions (PCI). This can be achieved using a number of intravenous and oral preparations. Intravenous (iv) antiplatelets include various glycoprotein IIb/IIIa (GPIIb/IIIa) inhibitors and the only available intravenous P2Y12 inhibitor, cangrelor. Available oral agents include aspirin and various P2Y12 inhibitors or their analogues. These are usually used in combination with the intention to maintain dual antiplatelet therapy (DAPT) for a period of time (generally up to 12 months) after the index PCI procedure. Understanding and appropriate use of antiplatelet agents are vital in optimizing clinical outcomes of patients with acute coronary syndromes, particularly in the emergency setting where the patient may be naïve to all pharmacological agents. In this review, an overview on antiplatelet therapy for patient needing emergency PCI is described, including evidence from important clinical trials and suggested antiplatelet therapy regimens by published clinical practice guidelines. Aspirin (acetylsalicylic acid) (≥75 mg daily) permanently inhibits platelet-dependent cyclooxygenase 1 (COX-1) enzyme and consequently preventing synthesis of and thromboxane A2 (TXA2), which is a powerful promoter of platelet aggregation . At higher doses, aspirin inhibits COX-2 which offers analgesic and antipyretic effects by blocking production of prostaglandin. Aspirin in a broad range of patients has been shown to offer clinically important benefits on protection from coronary artery disease (CAD). This predominantly appears related to antiplatelet effects, although the drug may also play a role in reducing atherosclerosis by blocking COX-dependent vasoconstrictors and prevent oxidation of low density lipoprotein. Importantly, aspirin has become a central component of the antiplatelet regimen both for patients with established CAD and those undergoing PCI procedures. This study was performed in the thrombolysis era but demonstrated a headline 23% reduction of mortality rate among patients with MI with a near to 50% reduction of nonfatal reinfarction or stroke. This study from the Antithrombotic Trialists’ Collaboration showed a 53% reduction of death and vascular events in those underwent coronary angioplasty. This study showed that in addition to protection from stent thrombosis, aspirin offered a significant reduction of stent restenosis rate after PCI. The P2Y12 receptor plays a key role in the platelet activation process. Adenosine diphosphate (ADP) interacts with the platelet P2Y12 receptor stimulating activation of the glycoprotein IIb/IIIa (GPIIb/IIIa) receptor. In turn, activation of the GP2b3a receptor results in enhanced platelet degranulation and thromboxane production, driving platelet aggregation . Various P2Y12 inhibitors are available. Clopidogrel and prasugrel are thienopyridine prodrugs that must undergo cytochrome P450-mediated conversion to the active metabolite which then covalently bond to the P2Y12 receptor, thus inhibiting platelet activation. In contrast, ticagrelor and cangrelor are direct-acting platelet inhibitors which do not need activation. These agents are thus more potent and have more rapid onset of action. This trial showed a significant reduction of cardiovascular death and myocardial infarction post PCI using clopidogrel. This trial showed a significant reduction of cardiovascular death, nonfatal myocardial infarction, and stroke using prasugrel among patients with high-risk ACS undergoing PCI. Of note, patients with prior stroke, transient ischemic attack (TIA), age > 75, and weight < 60 kg had no net benefit. This trial showed a reduction of composite death from vascular causes, MI, and stroke with use of ticagrelor. Of note, patients with prior stroke, TIA which led to net harm, age > 75, and weight < 60 kg had no net benefit. GPIIb/IIIa inhibitors directly target the platelet glycoprotein IIb/IIIa (GPIIb/IIIa) receptor. This receptor is the most abundant integrin found on the surface of platelets and is composed of two separate subunits, αIIb (GPIIb) and β3 (GPIIIa). GPIIb/IIIa inhibitors prevent binding of primarily fibrinogen, but various other ligands also, hence, inhibit the aggregation of platelets . Various agents are available: Abciximab is a monoclonal antibody. Eptifibatide is a synthetic cyclic heptapeptide. Tirofiban is a nonpeptidal antagonist to glycoprotein IIb/IIIa receptor. Review of multiple trials showed statistically significant benefit in GPIIb/IIIa treatment groups in terms of composite outcome of death, subsequent MI, and revascularization. 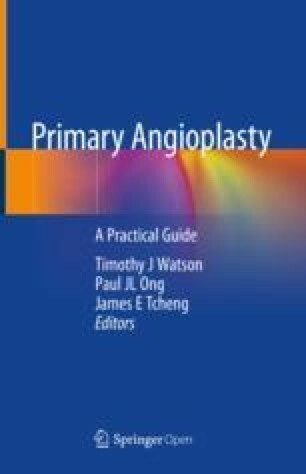 Usage of abciximab during coronary angioplasty after presentation with high-risk unstable angina showed significant reduction in composite death, nonfatal MI, repeat coronary artery bypass grafting (CABG), repeat PCI for recurrent ischemia, or requirement for a coronary stent after balloon angioplasty. Usage of eptifibatide in patient with ST changes and MI (but not persistent ST elevation) together with aspirin and intravenous heparin, via infusion for up to 96 h, significantly reduces composite of death and nonfatal myocardial infarction within 30 days from index event. Usage of tirofiban with heparin infusion in patient with acute myocardial infarction for up to 72 h showed significant decrease of 7 days to 30 days composite death, recurrent myocardial infarction. A potent, faster onset and superior clinical efficacy P2Y12 inhibitor (prasugrel or ticagrelor) is recommended ideally prior to (or at least at the time of) PCI. Ticagrelor is recommended as P2Y12 inhibitor of choice on top of aspirin in patients with ACS. Ticagrelor should not be used in patient with previous intracranial hemorrhage or ongoing bleeds or on oral anticoagulants. Prasugrel should not be used in patient with previous intracranial hemorrhage, previous ischemic stroke or transient ischemic attack, or ongoing bleeds or on oral anticoagulants. Prasugrel is generally not recommended in patient >75 years old or weighing <60 kg. In cases prasugrel is used for patient >75 years old or weighing <60 kg, a dose of 5 mg OD should be used. When none of the ticagrelor or prasugrel can be used, clopidogrel can be the choice of P2Y12 inhibitor. 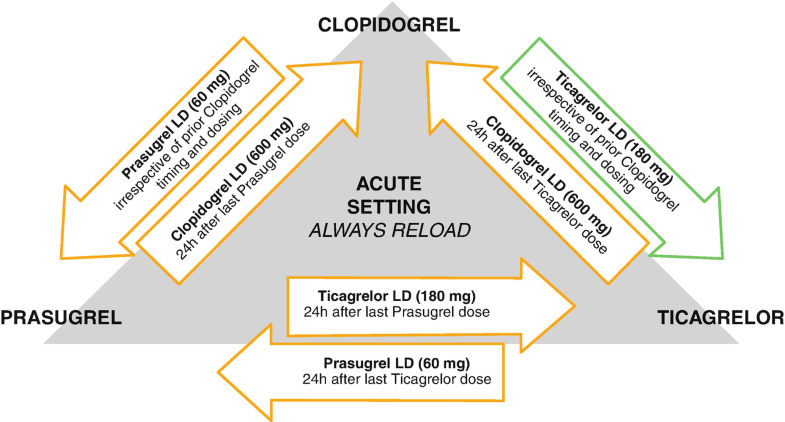 Switching from clopidogrel to either ticagrelor or prasugrel in acute setting need not consider prior clopidogrel timing and dosing (Fig. 8.1). Switching in between ticagrelor and prasugrel or from either one to clopidogrel in acute setting requires 24-h lapse since the last dose (Fig. 8.1). Bleeding risk can be assessed using risk model, e.g., PRECISE-DAPT and DAPT score. 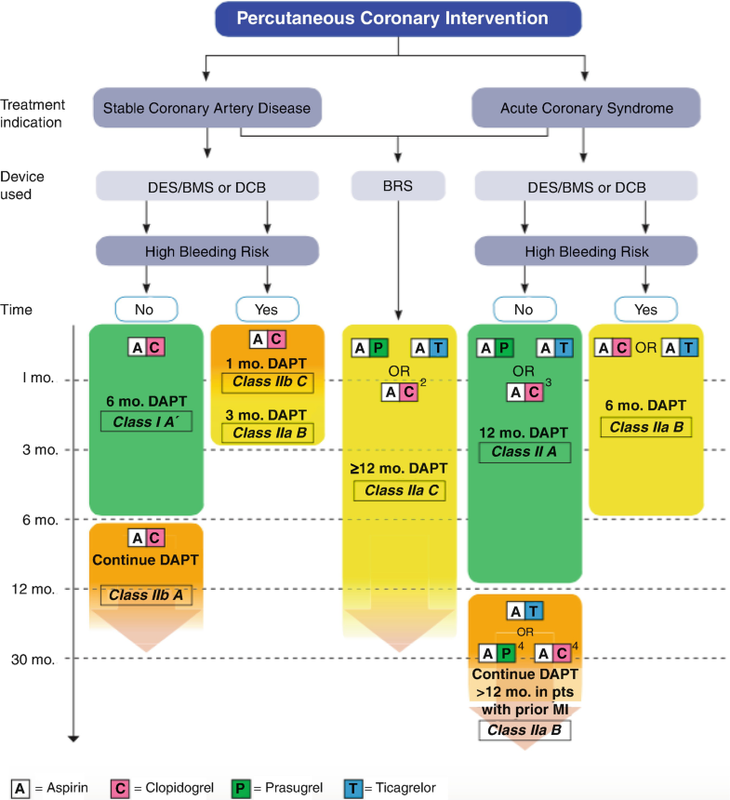 Bleeding risk decides duration of DAPT (Fig. 8.2). At least 12 months of DAPT (aspirin and a P2Y12 inhibitor) is recommended. Six months of DAPT should be considered if there is high bleeding risk; with emerging data for abbreviated DAPT with certain stents, even earlier cessation may be possible. Extension of DAPT >12 months may be considered if no bleeding complication during initial treatment. Absolute decrease in risk of instent thrombosis, myocardial infarction, and major adverse cardiac events by 1–2%. Absolute increase in bleeding complications by 1%. More benefits are seen in patient with ACS rather stable IHD. Shorter duration (3–6 months) may be reasonable in patients treated with newer-generation stents as compared to first generation. Emerging data may permit even shorter duration; trials are awaited. Glycoprotein IIb/IIIa inhibitor usage in prehospital or upstream settings has not shown extra benefits on efficacy of treatment. Selective downstream usage of GPIIb/IIIa inhibitors reduces cost of treatment and bleeding risk . Usage of glycoprotein IIb/IIIa inhibitor during coronary catheterization as a bailout therapy can be considered. This includes large thrombus, slow or no reflow, or other findings of thrombotic complications during coronary angiogram . Loading of aspirin and clopidogrel (the P2Y12 inhibitor of choice, 600 mg loading dose) should be done. Also receive additional parenteral anticoagulation. Chronic oral anticoagulation therapy should not be stopped during admission. Gastric protection with a proton pump inhibitor is recommended. Triple therapy (oral anticoagulation, aspirin, and clopidogrel) should be considered for 6 months after STEMI. Oral anticoagulation plus aspirin or clopidogrel should be considered for an additional 6 months; after which, it is then indicated to maintain oral anticoagulation. For patients with atrial fibrillation as the indication for anticoagulation, rivaroxaban in combination with clopidogrel and without aspirin may be a reasonable choice. The use of ticagrelor or prasugrel is not recommended as part of a triple therapy regimen with aspirin and oral anticoagulation. DAPT is an important periprocedural pharmacotherapy in patient receiving PCI. DAPT, aspirin, and a P2Y12 inhibitor are to be loaded orally as soon as diagnosis of ACS was made. Choice of P2Y12 inhibitor includes prasugrel, ticagrelor, and clopidogrel. Duration of DAPT treatment after emergency PCI depends on bleeding risk assessment and types of stents used. Extra attention in cases with bioresorbable vascular scaffold, which requires at least 12 months of DAPT regardless of bleeding risk. Glycoprotein IIb/IIIa inhibitor usage depends on treating physician justification as no conclusive evidence of its routine use in emergency PCI. Guidance on the use of glycoprotein IIb/IIIa inhibitors in the treatment of acute coronary syndromes. Technology appraisal guidance [TA47]. Published date: 05 September 2002; Last updated: 01 March 2010. https://www.nice.org.uk/guidance/ta47.